Every year in October, financial advisors of 49 of the union government's 50 ministries begin trooping into the finance ministry to hold preliminary discussions for the coming financial year's budget. This year, the exercise began on October 21, and financial advisors are likely to be given blunt advice: temper your demands and lower expectations. The reason: India is stumbling into possibly the most challenging financial year in a decade. Already, growth forecasts for the current year are being marked down in the wake of the worsening global economic outlook and faltering industrial growth in India. On October 20, C. Rangarajan, Chairman of the Prime Minister's Economic Advisory Council, said the economy would grow "close to eight per cent" in 2011/12, just three months after he had forecast 8.2 per cent. In January, he forecast a nine per cent growth for 2011/12. "Policy crunch is much higher than expected earlier," says Dharmakirti Joshi, Chief Economist at Crisil, explaining that a paralysed government was partly responsible for forecasts going haywire. 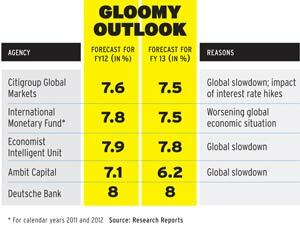 In January, Crisil forecast 8.3 per cent growth for 2011/12 and revised it to 7.65 per cent in October. India's economic situation today is reminiscent of late 2008 when Lehman Brothers collapsed. Inflation is high and the interest rate is being hiked to combat it. But the similarity ends there. In 2008, the fallout of the financial crisis on India was cushioned by a government that loosened its purse strings to keep the momentum going. After three years of nine per cent-plus growth and fiscal rectitude, the government could provide a crutch. Today, after three years of loose fiscal policies and faltering economic reforms, the government has become a part of the problem. Expenditure is running high, neutralising the central bank's tight monetary policy, and tax ratios have not recovered to 2008 levels. Finance Minister Pranab Mukherjee put matters in perspective at a conference with economic editors in October when he ruled out a stimulus next year. "That type of fiscal expansion cannot be maintained," Mukherjee said, referring to the expansion in financial deficit from 2.55 per cent of gross domestic product, or GDP, in 2007/08 to 6.04 per cent the next fiscal year on account of the stimulus to neutralise the fallout of the financial crisis. Fiscal deficit is the excess of expenditure over revenue that is met through borrowings. Persistent inflation is the primary reason India confronts another global economic crisis in an enfeebled state. It has been over nine per cent during 11 of the last 12 months, significantly higher than the threshold of four to six per cent identified by the Reserve Bank of India, or RBI. RBI has responded with 12 interest hikes since March 2010, which, Mukherjee said, had been partly responsible for killing fresh investments. "The key to growth will be whether inflation comes under control," says D.K. 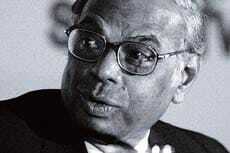 Srivastava, Director of Madras School of Economics. Inflation was 9.7 per cent in September and Mukherjee forecast it would subside to around seven per cent by end-March 2012. Forecasts of a falling trend in inflation are unlikely to trigger an immediate change in RBI's tight monetary policy. According to Srivastava, even if inflation hits a plateau soon, RBI will wait for about two months before it starts rolling back interest rates. An unintended effect of the rate hikes is that it has made the government a part of the economic problem, a factor that may explain Mukherjee's pique. Government spending is almost never rolled back. For instance, total expenditure in financial year 2002/03 was Rs 4.13 trillion and by the end of March 2012 it is expected to be Rs 12.57 trillion. The increase in expenditure would not be a problem if revenue growth outpaced that of expenditure. In India, however, tax revenue rests on a narrow base of taxpayers and depends heavily on the performance of top companies. "It is very sensitive," says Ketan Dalal, Joint Leader, Tax & Regulatory Services, PricewaterhouseCoopers. Moreover, a dip in profit at the top has a ripple effect that travels through the supply chain. To make matters worse, the growing engagement of India's top companies with the global economy makes them vulnerable to problems in Europe and the United States. "Slowdown in the global economy is very sharp and risks have risen," Joshi says. The upshot of the global linkage is that tax revenue is vulnerable to the downturn. "They are far more tied to the global economy as compared to 2001, maybe slightly more than 2008," Dalal says of the top companies. The combination of increasing expenditure and tax revenue that is sensitive to economic conditions is that fiscal slippage continues. Mukherjee admitted that it would be a struggle to stick to the current year's target of keeping fiscal deficit at 4.6 per cent of GDP in 2011/12. A Goldman Sachs report has forecast it could slip to 5.8 per cent of GDP, nudging interest rates higher and dragging down the investment climate. Fiscal slippage, therefore, means two things: there is no space left for a stimulus next year and it is a drag on growth. "A risk to the economy is emanating from the fiscal front where slowing growth is causing a sharp increase in the fiscal deficit and raising bond yields, which can then put further downward pressure on growth," the Goldman Sachs report says. In a gloomy scenario where the government cannot compress expenditure, the only possible solution is that it re-orients its spending towards creating infrastructure, which would begin to ease supply constraints. Srivastava points out that 2012/13 will be the first year of the 12th Five-year Plan and the government could step up its spending on creating capacity. "The appropriate thing is to restructure government expenditure which will be beneficial to growth," he says. About 45 per cent of total expenditure are locked into subsidies, interest payments on outstanding loans and defence spending. It leaves Mukherjee with little room to change the spending pattern. "If spending has to be changed, it requires a lot of political will," Srivastava says. But that is not forthcoming.